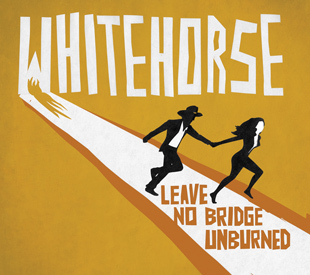 Nothing in Luke Doucet and his wife Melissa McClelland’s successful solo careers; or even their previous releases as Whitehorse prepared me for the big-big sound that they have created here on LEAVE NO BRIDGE UNBURNED. The opening bars to first track Baby What’s Wrong? Certainly piqued my interest and the loops, booms, whizzes and sparkling guitar licks that accompany the couple’s exquisite harmonizing had me grinning like a ninny four minutes later. By Sweet Disaster, which is only five songs in I had mentally decided that this album will definitely feature in my end of year Top 10; and if ever Quentin Quarantino remakes Hitchcock’s The Birds I can’t think of a darker, more atmospheric song to listen to as the credits roll. The guitar work on You Get Older is straight out of the Duane Eddy stable and the drumming is so cool it will freeze your veins; and don’t get me started on the mariachi trumpet that fades in and out. Who knows what some of the songs are actually about; this is an album of Sonic Alt. Country – Country Noir and nothing sounds better than Fake Your Death (and I’ll Fake Mine) which may be a Murder Ballad; or then again, perhaps not. If you like Nick Cave, The Handsome Family, Cowboy Junkies and/or Richard Hawley you are going to absolutely love Dear Irony and its luscious harmonies, scary twanging guitar and haunting piano never mind the deep and gorgeous lyrics. Like all music, not everyone will like this album (more fool them!) but those of us who do, will absolutely whig out of our tiny minds during the Rocking and Rolling Oh Dolores and The Walls Have Drunken Ears which close the album; with both songs sounding like what Phil Spector producing a Buddy Holly fronted Ramones might sound like. Hell! You might enjoy this album so much you could sell the rest of your record collection!